What can safely be described as the mystery of the century, the identity of Leonardo Da Vincis La Gioconda, popularly known as Mona Lisa has finally been revealed. The “Lady of the Louvre’ with her beguiling smile has inspired not just romantics or social causerie for 500 years but captured the imagination world wide of those greatly intrigued by her identity as much as the reason behind that smile that virtually captivated the planet. Deep in the archive of Heidelberg University, researcher Veit Probst says he has found a book that once belonged to Agostino Vespucci, a friend of da Vinci. In the margin of one page is a note from October 1503 which, the researcher claims, confirms the identity of the Mona Lisa as the Mona (for Madonna) Lisa del Giocondo, the third wife of a Florentine businessman Francesco del Giocondo. It is believed that her husband a flourishing tradesman had through his brother-in-law requested Da Vinci to make a portrait of his wife, a mother of 3, in her early twenties. Wow! women as fecund entities ever since times immemorial, despite being Mona Lisa. It has set the rumor mills at rest though. Imagine being tormented with stories which hinted that she was Da Vincis mother, his lover or even a transvestite, if not da vinci himself in female attire. I guess both LDV and Madame Lisa can rest in peace now. The mystery behind the smile? I insist it is that of a woman in her sixth month of pregnancy. There ne’er ever is beauty more devastatingly enchanting. Coupled with the fact that she obviously possessed a doting husband smitten enough to desire her portrait to adorn his home. Sigh….how utterly romantic…even after three kids!! I promised hubby this morning I’d make a bid for an even more enticing, enigmatic, sensual smile, were he to get MF Hussain to portrait me. There was a loud Hmph…. and then..a simple ” the guy paints horses or Madhuri Dixit…” Clever retreat aint it? Question that arises is does Dr. Nene ( of Madhuri Dixit fame) fancy a home adorned with her paintings by MF?? Why you might ask? Simbbly..to research if inveterate trends that bespeak of indifference to a wifes charisma apply to the husbands of divas too.. might just accord me a satisfaction enough to evince a devilish, mean, cynical grimace..diametrically opposite. light years away from the Mona Lisa above. Todays disgruntled Mona Lisa ..check this animation of Mona Lisa with its options ..its stupendously hillarious especially ‘with disdain’ click. Enjoy..and Cheers to Francisco del Giocando.. where art thou..buddy?! In all seriousness, I aint no Mona lisa and hubby aint no Giocondo..but if a tripod with camera and a zealously taken zillion photographs are evidence, I have quite a Da Vinci at home..touch wood. Who is she is revealed..and the modern day version is hillarious. Neha..chill! Aayega aane wala South west of bedroom mein hang a picture of peonies.Or better still paint it yourself. Ha ha dilip…I guess you are right.MD as Mona lisa.. what about Ash.. I believe just as of today she has been painted as Mona Lisa. ya… it really is the maximum city.. though i love calcutta n can go on abt the ‘life’ factor thatz there… but somewhere bombay is like one special city… for just the way it is… so i second u on that big time 🙂 wud be nice to have an episode of life @ mumbai-aa!! for now.. whenz a post coming where we can agree to disagree 🙂 or agree all over again!! Sapt, I’ve been to Cal during Xmas new years.. and it was rocking. Park street restaurant hopping was what we indulged in. The food was fantastic, music par excellence and the atmosphere was pulsating with joie de vivre. We dont have any such street in Mumbai. As for episode on Mumbai.. you see the only life I know is Mumbai life. I dont have a visitors perspective and neither a comparative study.So what i know of it is to me.. life. But an outsider would perhaps give a better inside look however paradoxical it sounds…e.g. I dont react to the language as much as perhaps you would.Traffic snarls, extreme juxtapositions of poverty and affluence, wheeler dealers, hi life.. is all ordinary to me not novel. But I think you have read my post on Mumbai.. 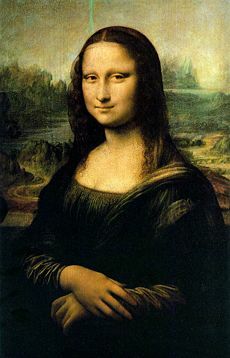 Although the Heidelberg University’s conclusion is not unreasonable, the reference in the book does not prove that the Mona Lisa painting was of Lisa del Giocondo. Check out an analysis done since then at http://www.MonaLisaNews.com that makes more sense to me.